I am so disappointed in how washed out the photo turned out. It looks so much prettier in real life. I haven't used my Delightful Dahlia stamp set in such a long time, and I enjoyed playing with it again. I thought about coloring in the flowers, but I liked them as is. Really, it does look so much prettier in real life! Great CAS design, Linda. I love the colors and the simple white sentiment. Beautiful. Linda, your dahlias are perfect. Simple and sweet! Love the placement of the flowers Linda. Very pretty! I love how you stamped the flowers different colours! pretty card and very patient hand cutting. Linda it is so beautiful and I imagine it is even more gorgeous in real life. The intricate cutting is a labour of love. Linda, I like the flowers how you stamped them, too! Pretty card! Black is difficult to photograph! Just beautiful. Those outlined flowers are so striking against that black background. Linda this is so lovely! I love the pearl centers you added to the flowers and the fussy cutting to add them to the bottom corner just right! I had a hard time photographing my black cards too! I need to take a photography class! LOL!!! I think it is so lovely, Linda...doesn't matter if photo or real life... I can tell! The white flowers with the pretty colored details really are a beautiful contrast against the black, especially with this cool layout! Hi Linda. This is beautiful I love that the flowers are not colored in and its stunning on black. Love it Linda! 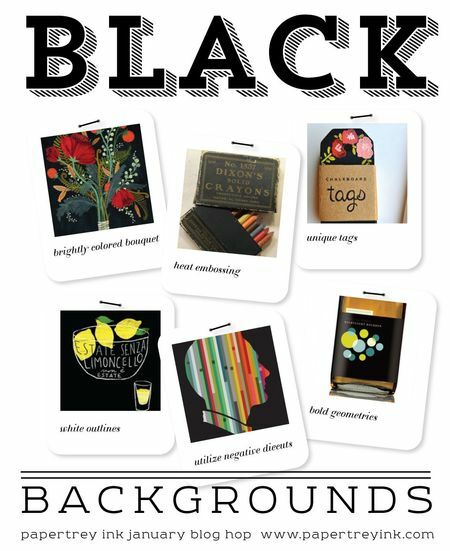 I love the flower out line on the black!! Just beautiful!! Linda, I love how you stamped and trimmed the flowers - beautiful card! This would be a perfect CAS card. The white embossed sentiment and the white floral image create a very sophisticated look. I could certainly be adapted for a bridal shower or birthday card with a sentiment change. Fun corner element. Great job on the PTI blog hop challenge. 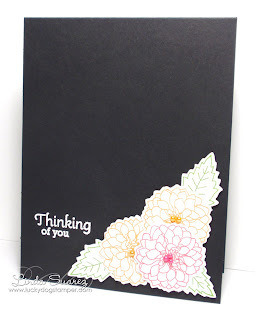 Love the colored outlines of the flower images & your pearl centers! Oh this turned out so pretty! Love the great contrast- the dark background really makes the image pop! I love the black background! Fabulous job!